Your eye’s behaviour in the landscape is different from a camera’s. The camera frames a scene. Your eye sees a pattern and is informed by it, following and exploring other patterns. We came to Kilmartin at Easter on a beautiful ‘summer’ day. We explored the cairns down the centre of the glen, kids running around and in and out. 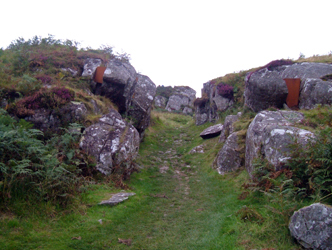 Its all been messed around with by bad interpretation and intervention – turning a chambered cairn into something more like a bomb shelter, in one case. Yesterday I was back for the NVA/National Theatre of Scotland‘s Half-Life (I don’t think the title refers directly to the bomb shelter). I got a book and a map with my ticket. When I opened the map it caught the light. The significant locations that form Half-Life, settlements and roads are simply presented in black on white, but the contour lines are also there in a clear gloss varnish. Fantastic. Last time we didn’t go to Dunadd. This time there is an ambient sound emerging from the ground and the rocks. As you pass through the entrance enfilade sheets of coreten are inserted amongst the rocks. Emanating from the steel is the sound of history? Ambient, abstract, geological, incomprehensible? Coming through the enfilade the sound is immediate. On the top of the hill the sound envelopes you more subtly, more part of the landscape because you have vistas. Of course Dunadd is the ancient seat of the Kings of Dalriadda, spanning the West coast of Scotland and also Northern Ireland. From Dunadd you can see Loch Craignish and the Sound of Jura, and below you in the foreground an incomprehensible symbol has been mown into the marshy valley floor. There are so many lines – roads curling over outcrops, dykes, straight fence lines more evident from the level line on the earth than the posts and wire. The profile of the surrounding hills is remarkable. The moments of green in the brown and purple. 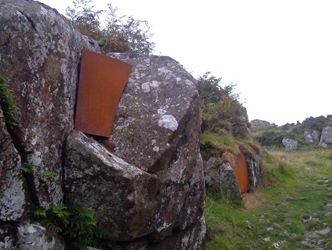 And then as you walk back down you see the abstract rust coreten shapes (a bit like Fred Bushe sculptures) amongst thegrey lichen covered stones, the sound of geology invading the mind, gurgling and rushing. 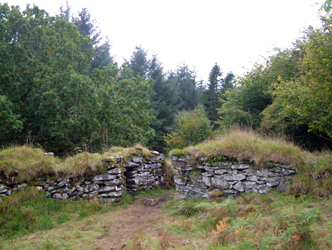 Next I went to Drum an Duin, the hill fort near Crinan. 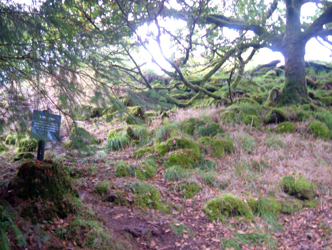 This is a different experience, buried in the woods, rather than an exposed hill top in the middle of the valley. In fact it must be on the hills next to the Loch when I was looking from Dunadd. Of course you can’t make out the location because its so buried in vegetation. I ran into Adrian Lear & Susan Grant, along with Adrian’s partner and another woman. The installation, another sound piece, was a sort of whining buzzing noise that didn’t do much for me. 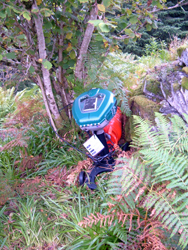 Adrian and Susan pointed out the Bug Buster which releases CO2 to drive off the midges. I have a real problem with that. Apparently NVA use them for all their projects and the company is a sponsor. Perhaps the installation is the sound of the bugs that aren’t there because of human technology. The final stop, where I saw Adrian, Susan and the others again was Mill Cottage. I was kind of afraid I was in for another sound installation. 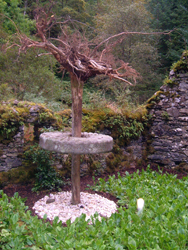 This one was different – in the middle of the one-room derelict roofless cottage was a dead tree inserted into the ground upside down. Halfway up had been set a new millstone. Around the bottom were white marble chips and covering the floor of the space was a vegetable garden of probably lettuce. All of these elements probably relate to the inhabitation of the cottage – kitchen gardening, milling, trees – not sure if the marble chips were a reference to lime? It was certainly an aesthetic construction with interesting formal properties in the specific space. But why? 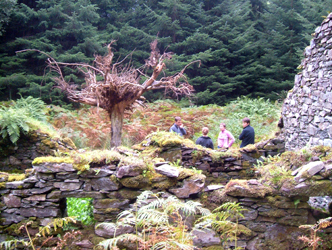 Anyway in the evening we went by bus from Lochgilphed to the site of the performance – sitting on bleachers facing a stand of pines with a stage set which I can only describe as being like a crown of thorns, though there is no specific Christian references in this work. By this time the rain which had been threatened had firmly set in. Actors and audience alike exposed to the environment. The piece is about death and about our relationship with it. It could be called ‘As above, so below’. Its a case of the archaeologist as the scientist investigating death: measuring, drawing, photographing. On another level its the archaeologist as interpreter of the signs – obsessed by the circle carved in stone: rippling outwards and spinning inwards, but knowing that these concepts are modern concepts overlaid on an unknowable and utterly different past. There is one version of death expressed in the ‘As above, so below’ structure which is played with visually and verbally. There is also another one which is the life and death are intermingled, and in fact we breath in the dead. It is understood that the prehistoric cultures which inhabited this region probably left the dead out to decompose, and only once they had, were they interred. Thus in a very literal sense the decomposing bodies became in part air to be breathed in by the rest of the community. Tim Ingold, in his lecture at the RSA Art & Ecology Conference spoke about our understanding of our relationship between the earth and the air. He argued vigorously against the idea that we live on the surface of the planet as some sort of exhabitants. He argued for understanding ourselves as creatures who breathe in the environment and exhale it, as plants do, being part of ground and part of air. He argued for studying in the elements. Tonight we studied in the elements and it was better for that. The performance was a mental storm, and the rain falling in sheets caught in the spotlights put us within the reality of breathing in the dead, breathing in the world, not as a removed audience, but within a shared experience. The archaeologist’s daughter seems to be sensetised to her environment and to feel where the barrier between above and below is thinner. I understand the sound installations in particular now through that frame – as ways of indicating where the barrier between the past and the present is thinner. In the end one of the roles of art is to show us a pattern so that we can be more attuned to other patterns we see.